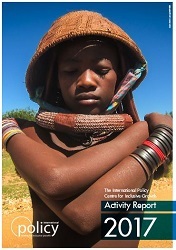 The April edition brings you a new study prepared by the IPC-IG and UNICEF, mapping the child sensitivity of more than 100 non-contributory social protection programmes in 20 countries of the Middle East and North Africa (MENA) region. We also bring you a compelling study on Brazil's history of inequality and share our 2017 Activity Report, providing an overview of the main activities and achievements of the Centre over the past year. In addition, we deliver news and updates regarding the IPC-IG's policy dialogue activities, including participation in events. 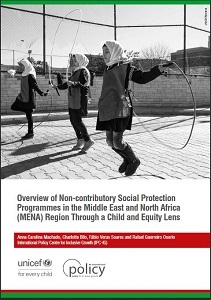 The IPC-IG and the UNICEF Middle East and North Africa Regional Office (MENARO) are proud to present an "Overview of non-contributory social protection programmes in the Middle East and North Africa (MENA) region though a child and equity lens". This report, prepared by Anna Carolina Machado, Charlotte Bilo, Fábio Veras Soares and Rafael Guerreiro Osorio (IPC-IG), assesses the state of child-sensitive design features of non-contributory social protection schemes in the MENA region, focusing on programmes implemented by national governments and that are at least partially financed by them. Providing both regional and country-level information, it maps 185 non-contributory social protection programmes across 20 countries: Algeria, Bahrain, Djibouti, Egypt, Iran, Iraq, Jordan, Kuwait, Lebanon, Libya, Morocco, Oman, Qatar, Saudi Arabia, Palestine, Sudan, Syria, Tunisia, United Arab Emirates, and Yemen. Additionally, under the scope of this project, the IPC-IG will publish a series of One Pagers, from May through December, featuring each of the 20 countries mapped. The report is available for download as a PDF in English, as well as in smartphone/tablet-friendly formats. In the Working Paper "A history of inequality: top incomes in Brazil, 1926-2015", Pedro H.G. Ferreira da Souza (Institute for Applied Economic Research - Ipea) uses income tax tabulations to estimate top income shares in Brazil over the long term. The author highlights that, despite the massive structural changes that the country has undergone since the mid-1920s—with urbanisation, higher levels of education and a steady increase in gross domestic product (GDP) per capita, Brazil's concentration of income at the top of the distribution has remained very high. The study is available in English, and an accompanying One Pager is available in English and in Portuguese. We are also proud to present you the IPC-IG 2017 Activity Report, which details our main activities, projects and achievements over the past year. The rationale behind this report is for the Centre to be accountable for its work to stakeholders, partners, donors and society in general, providing information on all the projects conducted in 2017. It is available for download in PDF in English and in Portuguese, as well as in smartphone/tablet-friendly formats in English and Portuguese. The Policy in Focus issue “Social protection after the Arab Spring” is now available in French, after initially being released in English. Featuring specialist guest editors Rafael Osorio and Fábio Veras (IPC-IG), this issue gathers 17 articles with diverse perspectives from leading scholars, researchers and practitioners to examine the current state of non-contributory social protection in the MENA region as a whole and in specific countries, and explore how these countries have been coping with and learning from recent economic and humanitarian crises. It is also available in smartphone/tablet-friendly formats in French. An Arabic translation of this issue will also be available soon. The One Pager “Social protection systems in Latin America and the Caribbean: Peru”, by Milena Lavigne (Consultant for ECLAC’s Social Development Division), is now available in Arabic. It was previously released in English and Spanish. The One Pager “Social protection systems in Latin America and the Caribbean: Paraguay”, also by Ms. Lavigne, was translated into Arabic, following its release in English and Spanish. These studies are part of a series of One Pagers aimed at disseminating knowledge on the current status of social protection systems in countries in Latin America and the Caribbean, and discussing their main challenges in terms of realising the economic and social rights of the population, and achieving key development goals. The series is a joint initiative between the Economic Commission for Latin America and the Caribbean (ECLAC) and the IPC-IG. Finally, the One Pager “Mainstreaming Graduation into social protection floors”, by Harshani Dharmadasa, Ian Orton and Lauren Whitehead (BRAC USA), is now available in Portuguese and Spanish. It was previously released in English and in French. Our colleagues and partners from the socialprotection.org online platform hosted a two-day technical meeting with David Fuentes-Solano, Assistant Director of the Poverty and Social Transfers department of the Development Policy Division of the Australian Department of Foreign Affairs and Trade (DFAT), on 17 and 18 April, at the IPC-IG’s office in Brasília. The objective was to discuss current and future joint activities between the Centre and DFAT. 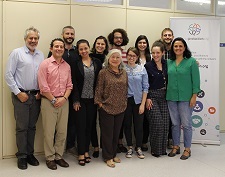 IPC-IG Senior Research Coordinator, Diana Sawyer, delivered the opening remarks and presented the Centre’s activities and projects, while Sergei Soares, Ipea Researcher and IPC-IG Research Associate, presented a thoughtful briefing on current social protection issues in Brazil. Senior Project Officer, Mariana Balboni, presented socialprotection.org’s achievements, futures projects and partnerships. DFAT, along with the German Society for International Cooperation (GIZ), is one of the funders of the platform, which was launched on 12 September 2015. The Centre participated in the international conference Potsdam Spring Dialogues 2018, "Strengthening Social Protection in Africa: National, Regional and international Strategies" held in Potsdam, Germany, on 19 and 20 April. Our researcher Raquel Tebaldi participated in a round-table discussion titled "Social insurance: a social contract as a basis for contributory approaches?". Some of Africa’s current social protection strategies were presented and discussed critically at the event, and various programmes and funding models were analysed. Raquel Tebaldi will also join the annual meeting of the francophone group of the Community of Practice on Cash Transfers in Africa, organised by the World Bank, in the Senegalese capital, Dakar, from 23 to 27 April. The topic of the meeting will be social registries. 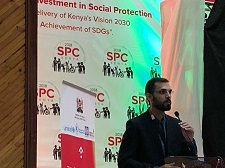 The IPC-IG participated in the 2018 Kenya Social Protection Conference, held in Nairobi, from 20 to 23 March. With the theme: “Scaling Up Investment in Social Protection for the Delivery of Kenya’s Vision 2030 and the Achievement of the SDGs”, the conference aimed to create an opportunity for learning and sharing experiences among various social protection actors, to stimulate, motivate, promote and advocate for increased investment in social protection. IPC-IG Senior Research Coordinator Fabio Veras delivered the keynote address: “Social protection: an effective means for reducing poverty and vulnerability" and joined the discussion "Roadmap from 2015? The gains and achievements in the social protection sector". In addition, IPC-IG Senior Researcher Alexander Cambraia presented the case study "Brazil's social protection policy and legislation experience" in the panel session "Enhancing complementarities in social protection”. 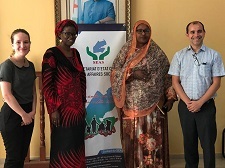 The Centre’s Senior Research Coordinator Fabio Veras and Researcher Raquel Tebaldi travelled to the capital of Djibouti to join a mission organised by the UNICEF, from 25 to 29 March 2018. The Government of Djibouti has finalised drafting national a social protection strategy for Djibouti from 2018 to 2022. The IPC-IG, under the scope of the project to support UNICEF Country Offices in the MENA Region, was requested to send a team of social protection experts for a one-week mission to support UNICEF Djibouti’s Country Office and the SEAS (Secretariat d’État chargé des Affaires Sociales) in further discussing the operationalisation of the new social protection strategy in a child-sensitive manner. The IPC-IG carried out a mission to Angola from 5 to 17 March. The Centre's Senior Researcher Alexander Cambraia and Research Associate Pedro Arruda travelled to Luanda as part of an ongoing project developed in partnership with UNICEF Angola, aiming at designing a system to monitor the activities of the Integrated Social Assistance Centres (CASI). The Centres will begin their activities in May 2018. During the mission, the IPC-IG researchers presented tools for data collection and monitoring to programme managers and activists. This was also an opportunity to ensure that the proposed project flow is adapted to recent changes in the CASI operational design. In addition to Luanda, the team also visited municipalities, communes and local offices in the provinces of Muxico, Bié and Uige. They will eventually return to Angola at a later date to present a final version of the monitoring system.